It’s well-known that including 3PL service providers can boost warehouses’ success rate and simplify your supply chain. While many companies use 3PL providers, some problems can still arise in the process. One such pitfall is the lack of direct control over the warehouse management processes. This lack of control can lead to client companies having to settle for little to no knowledge over the way that a warehouse is run. Luckily, with the software solutions that are available today, it’s much easier for 3PL companies to provide extensive visibility to shippers that use their services. As 3PL management companies implement modern technology, a rise in their adoption is sure to become a trend. When a 3PL company provides services to multiple clients (known as multi-tenant warehousing), the complexity of their warehouse operations rises. Implementing a comprehensive warehouse management system grants a 3PL company organized data on warehouse stock, and an easy way to keep track of goods belonging to multiple clients. Integrating one of these software solutions makes this process manageable and helps 3PL companies increase productivity and client satisfaction. What is a 3PL Warehouse Management System? As a whole, warehouse management systems (WMS) are intended to streamline the many time-consuming processes of running one or more warehouses. As with all warehousing systems solutions, there is no one size fits all. Integrating WMS with 3PL in mind leads toward different packages than something meant for a single warehousing enterprise. Multi-client architectures, 3PL billing functionality and other value-added services are examples of additions that mesh well with 3PL integration. Before making any decisions, find out what you need to supply your 3PL with to keep them running smoothly. 3PL companies are there to make your life easier. Any time you can provide them with updated tools and efficiency upgrades you should. Smoothing out any bumps they may experience sets you up for success in the future. The ability to see data in real time is an essential feature required of any serious third-party logistics company. Shippers using 3PL services want to have the opportunity to access reports, view progress easily and track inventory remotely with the help of web portals. Providing access to customers is beneficial to 3PL companies as well. According to the 20th Annual Third-Party Logistics Study, 80 percent of third-party logistics service providers and 84 percent of their customers agreed that it would be helpful to have an automated way for shippers to log in and see requests from their 3PL management system to approve of decisions, activities and documents. 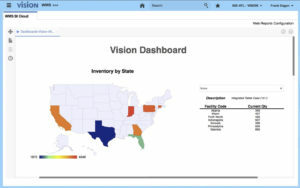 It’s clear that a big part of 3PL services revolves around providing 3PL inventory management visibility to their clients. Luckily, many of today’s warehouse management solutions seamlessly integrate with enterprise resource planning or enterprise accounting software solutions, which can provide visibility through a web portal. These portals allow clients to view inventory levels, place orders and perform other tasks. The easy access that’s made possible with 3PL web portals eliminates the need for time-consuming tasks such as manually generating customer reports. Instead, clients can log in securely and access the data at any time, using any device. Added functionality such as in-advance shipping notices (ASNs) and the ability for customers to schedule picking and shipping demand by themselves makes the portal not only convenient but necessary. While third-party logistics WMS are a tool for management, these warehouse manager systems serve another critical role in customer service. Because of the need for constant interaction between freight shippers and 3PL companies, a WMS that can instantly provide information such as the location of the goods is essential. If a 3PL company can’t tell a customer where their goods currently are, customer retention will drop. With the inclusion of comprehensive 3PL warehouse management software, it becomes much easier to track and manage goods. Many of these solutions allow tracking via UPC, SKU, batch, package, parts and serial number. While so many options seem excessive, having multiple tools available is valuable in a multi-tenant warehousing situation. Such complex inventory control systems show why a barcode system to track goods is essential. It streamlines warehousing and tracking tasks, reducing the number of manual tasks and increasing the efficiency and accuracy of operations. A report by Auburn University RFID Lab showed that inventory accuracy at the stock-keeping unit (SKU) level is about 65 percent, while an RFID can get this number up to 95 percent or even higher. Another important part of inventory tracking is the ability to log all the inventory activity in and out of the warehouse, including in-warehouse transfers. Data about these in-house movements can be very beneficial when the need to perform a complete audit arises. To quickly identify and correct any errors, especially in multi-tenant warehousing, extensive record keeping is critical. Luckily, today’s warehouse management systems provide many benefits to improve efficiency and excellent customer service. When providing 3PL services for multiple clients, billing becomes a very complicated process. Manually tracking transactions and compiling them into bills is a process that can take days to complete. Such an undertaking wastes time and can even strain customer relations. With so many transactions needing to be processed errors are bound to appear. Mistakes in billing look very unprofessional and can even seem dishonest, which is a critical error when building trust with a client. That’s why a comprehensive 3PL warehouse system is so important. It provides all the tools necessary to establish an accurate billing system that dramatically cuts the time that billing takes up, while simultaneously improving its functionality. Because of the way that a 3PL WMS can use barcode scanners, it becomes much easier to track every single transaction, as well as every movement in, out of and within the warehouse. With this ability, accurate invoices can be generated at any moment using real-time data. 3PL companies are fulfillment experts. They take on many headache-inducing fulfillment practices to save their clients time and hidden fulfillment costs that come with running their own operations. Integrating a WMS with the intention of streamlining fulfillment processes makes these cumbersome duties easier on your 3PL partner. When responsibilities such as replenishing shipping supplies, purchasing equipment for the fulfillment services center and leasing new warehouse space fall to a 3PL, a WMS with fulfillment options is a great choice. ECommerce 3PL assistance is on the rise as demand for products continues to grow. Integrated 3PL WMS solutions allow all electronic sales channel points to report directly to the 3PL for order fulfillment when orders come in. This data is then compared against real-time inventory stocks and can help with the shipment automation process. 3PL companies come in many different shapes and sizes. Some provide general solutions, while others narrow their focus on more specialized solutions. Your business and client partnership can help guide you to a specific WMS choice. A general 3PL company focuses on just that, general logistics. Many of the topics above are necessary inclusions for general third-party logistics providers. A niche 3PL provider specializes in a particular industry or market. For example, a niche 3PL provider in the hazardous materials (HAZMAT) market needs MSDS (material safety data sheet) functionality. Cold storage warehouse operations can implement a WMS that allows FIFO and FEFO picking to suit their needs better. It would be best if you always kept your general or niche needs in mind when choosing a WMS. Please spend some time defining your particular requirements, and then take a look at our requirements template to narrow down the best solution for you. A recent study has shown that an estimated 86 percent of Fortune 500 companies and 96 percent of the Fortune 100 use 3PL services. With such explosive growth in the usage of 3PL warehouse and inventory management software, 3PL companies are taking steps to create the best possible software solutions. One significant benefit to this is that 3PL companies know what they need to be successful. Instead of waiting for new software to come out, they are taking the initiative and creating software suites that tackle the many problems they face. Expect increased efficiency, intuitive design, and advanced services from emerging 3PL management software as time goes on. 3PL companies stepping up to the plate and designing software offers many other significant benefits. One such advantage is the reduction of downtime when integrating these new solutions. With intuitive software built specifically for the use of 3PL companies, you can expect less downtime when orienting around the implementation of new software. Third-party logistics are here to stay and provide a wealth of benefits for companies that integrate their services. Freeing up time and resources while maintaining efficiency and customer satisfaction are paramount in healthy supply chain management. As the shipping and warehousing demands rise 3PL centric warehousing, inventory and transportation management solutions will continue to grow in accessibility and strength. If you have not considered adopting a 3PL focused WMS solution, now is the time! How has a properly implemented WMS helped your 3PL partners? Let us know down below! Thank you for sharing this post. I am very glad to visit your site. I like the way of your presentation. It’s really an informative post you have shared here. I surprise how much effort you put to create such a great informative website. please keep sharing. I’m glad you enjoyed the post! Thanks for taking the time to leave a comment!